A trainer prescribed “desensitization” for my dog’s separation anxiety. What does that mean? For serious stress-related issues such as separation anxiety and aggressive behavior, consulting a reputable trainer or behaviorist is strongly recommended. In those cases, desensitization is usually the preferred method of treatment. 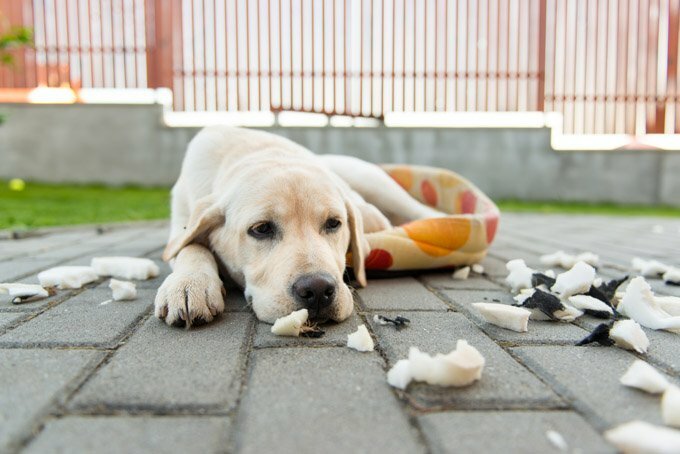 Essentially, desensitization means very gradually exposing your dog to the thing that triggers his discomfort; the process usually involves counter-conditioning–the pairing of positive reinforcement with the trigger stimulus. The idea is to eliminate the unwanted behavior by creating a new, positive association around the trigger. In plain English: Your dog barks and lunges (anxious behavior) whenever the neighbor kids whiz by on their bicycles (trigger). Solution: Starting with very limited exposure, pair the sight of kids riding bicycles with plenty of treats and praise (positive reinforcement). Over time, your dog will start liking, or simply ignoring bikers, rather than finding them nerve-wracking. Here is an extremely general example of what that process might look like: Place a small bicycle at the far end of your yard. If your dog can tolerate the sight of it (that is, no lunging or barking), praise him effusively and shower him with treats. If it makes him nervous, move the bike to the next yard (or down the street or however far away the bike needs to be in order for your dog to remain at ease). Gradually move the bike closer to your own yard, treating and praising at each new interval. Next, ask a friend to stand next to the bike, but not ride it. Again, if your dog reacts calmly, treat and praise him. Next, ask your friend get on the bike and remain stationary, and then to slowly ride the bike a few feet, and then to ride it a little faster and a little further. Every time you travel a little further, your dog receives treats and praise. The goal is that eventually, your dog will become totally unfazed by the sight of bicycles whizzing past. Again, this is a very broad description of a very gradual and specific process. Each step may take several sessions, several days, or several weeks–or it may need to be broken down into even smaller steps in order for your dog to comfortably tolerate what’s being asked of him. How quickly you move depends on your dog. Again, the guidance of a trainer is strongly advised.